Buffalo State's Patricia H. and Richard E. Garman Art Conservation Department played a role in a recent scientific discovery of international significance, one spanning centuries and continents. The mystery began with a mislabeled egg. In February, Paige Langle, the collections manager of zoology at the Buffalo Museum of Science, found a foot-long, cream-colored egg in a cabinet that was labeled a model. She suspected it might be a real elephant bird egg. 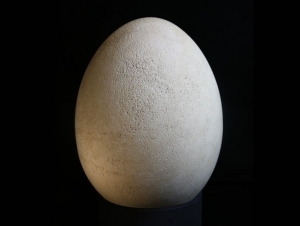 She and her colleagues dug through archives to discover that the museum had purchased a sub-fossilized elephant bird egg from Edward Gerrard & Sons of London in 1939. She sent the specimen to Buffalo State for examination. Jiuan Jiuan Chen, assistant professor in conservation imaging, technical examination, and documentation, Jonathan Thornton, professor of objects conservation, and three second-year art conservation students examined the egg. They used radiography to see inside and concluded that it was no model, but rather an egg that may have been fertilized. It belongs to that of a long-extinct elephant bird that stood 10 feet high and roamed the island of Madagascar in the 1500s. The Smithsonian Magazine wrote an article about the discovery. The story was covered by several other news outlets, including Newsweek and the Buffalo News. The egg will be displayed in the museum’s Rethink Extinct gallery starting May 1. There are fewer than 40 such eggs known to exist in public institutions.